Since airing of the corset segment on the “20/20” show on ABC-TV last Friday, Oct. 12, I’ve received many Facebook messages, emails and telephone calls. As I might expect, to a person these inquiries and comments have been positive, curious, and open to further information on the process of corset waist training. Callers ask about how waist training can create both waistline inch loss and pound loss as well, or just one of these depending on how you go about the process. To a person, comments of those who watched the program have also reflected puzzlement that national entertainment tv media continues obstinately and inevitably to associate corseting –which helps one lose weight in a fun and fashionable, non-harmful way — with “extremism” and harm. 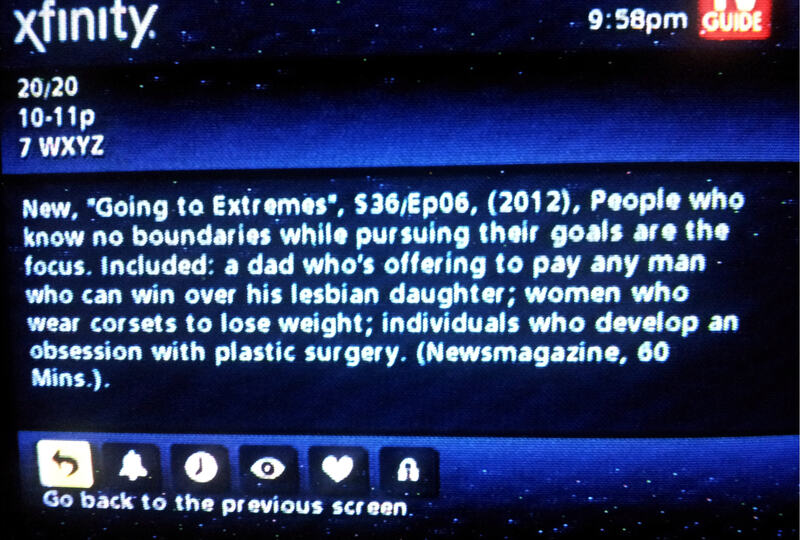 Witness what one announcement on the “20/20” show said: “waist training is the extreme of corseting.” Witness the theme of the entire show: Extremism. Keturah, the producer who kindly sought us out for initial program research and preparation, did not reveal that program theme to us. We posed two or three questions to her during a week of multiple emails and telephone calls to prepare, and five hours of filming. Perhaps the press of her incredibly busy schedule caused her to overlook our inquiry. In the end it all boiled down to our 45 second appearance as reporter Deborah Robert’s coach. You’ll see above and to the left, the lovely little trainer corset we delivered to Deborah to experiment with, produced by Jill on our great corsetiere team (we also gifted Ms. Roberts with a matching refrigerator magnet using her corset fabrics). Ms. Roberts went about her corseting experiment using common sense and moderation as we advised and as we expected her to do — so what is “extreme” about that? Know no boundaries? First of all, the non-sequitur of this advance publicity is nothing short of hilarious. Comcast got it entirely and quite evidently wrong: corsets create boundaries not only for our expanding flesh, but more importantly, boundaries for our obsession with food, our overeating, and our poor self image. They support and encourage discipline and self- control. To that extent, corset waist training encourages the path of moderation; Aristotle and mom would be proud! What is “extreme” about wanting to take care of one’s health, improve one’s figure and posture, and lose weight in a few months via a fashion garment? What’s extreme about that, in a society where 50% of us American’s will be obese by next year, according to the information provided recently on the tv show “The Chew”? Isn’t obesity the real shocker here? Isn’t our continuing seeking for the “quick fix yesterday” the real culprit in our size health crises? I’ve always known the risk of cooperating with the media regarding my topic, profession and product. By necessity the popular media has to boil down any issue to minute-long segments and second-long sound bites, due to the short attention span of the general viewing public and limited financial resources these days to pursue in-depth reporting. They simply are unable to give a complex topic the time it deserves. Accordingly, there’s an inherent risk in boiling down the topic of corseting, because of the misinformation out there, and long-lived prejudices against the garment. Prejudice is associated in my opinion with our deep-seated American Puritanical history that causes some of us to instinctively recoil from female sexuality. The corset definitely sexualizes the body and reveals feminine curves, but its magical benefits reach much farther than that. In the case of the “20/20” producer’s invitation to be interviewed, I accepted the risk once more as I have during the past five times I have cooperated with the popular national media, because of the invaluable opportunity offered for me to reach out to those who might never have considered the health benefits of corsetry. I optimistically (according to my nature) felt I would be accurately quoted– and was, but for shortening of one statement that heartburn may occur — if you eat too quickly or too much. I hoped for a moderate, fact-based approach as I and many others whom they interviewed, stressed, and generally those quoted and those corseted ladies shown, were not at all extreme. I banked on the hope that — even were the traditional media viewpoint to prevail in their “spin” of the topic, some program viewers might at least “hear” a positive message about corsetry and open up their minds. I hoped for that, even if my callers continued to hesitate because of comments included in the program in what some might call a misguided effort to be objective and discuss the opposing viewpoints — comments such as those offered by the OB-GYN who opined that corsets “cause lung damage” (see excellent blog on that comment at lucycorsetry.com). Quite earnestly I will soon attempt to reach out to the physician to ask about the factual basis for her opinion. I wonder how many patients she has treated in her practice, who corset regularly and waist train, who have also experienced lung damage? I would be surprised if there were one. I wonder about the kind and extent of that damage, and whether it became permanent? At least my mind is open to facts and continued learning, so that I don’t mislead my clients or waist-training students. However, in 24 years of discussing the corset with clients and many other corset enthusiasts and in my personal wearing experience of many different styles of corsets over the years, I’ve never encountered this kind of damage or heard about it before, other than in Victorian novels. Nor have the eight doctors with whom I’ve consulted (seven of whom corset themselves) who have reviewed my book text, ever reported that kind of damage or risk of same. And I made that fact clear to the producers of the show during their advance research, and also to reporter Roberts during my interview. Roberts then quite willingly, responsibly, and even joyfully, set out to wear her adorable corset and to experience waist training personally. That some rock stars and folks buy brand but not fit or quality, that we tolerate real damage, and that we admit to same, make those women sound truly foolish — and clearly, some of us are. Having a lot of money or education has nothing to do with exercising common sense and demanding quality and value for what we pay. As one of my friends so kindly said a long time ago: “When you deal with ROMANTASY you always get what you pay for. When you deal with others, then maybe you don’t.” While corsets certainly aren’t for everybody, and while no business including ours, can be perfect or please everyone, we do strive to be responsive within the limits of our humanity and our ability — and we always focus on education first and never, ever push anyone to buy a garment that might not fit their needs, lifestyle, or budget, or fit our skill level and ability to deliver. We are always heartened to know that we are succeeding in accomplishing our business mission and should keep on keeping on, when we receive unsolicited comments such as that Janine just sent us. We had questioned her measurements in an online order, and asked her to retake them to be sure of a good fit: “Ann No, thanks go from me to you. I must say I am touched by your caring personalized service and I am looking forward to talking with you as we go forward :).” (10/16/12). In reflecting on my experience working with the ABC-TV crew (sound and lighting crew seen below right), two producers, and one media star, Ms. Roberts — all of whom were cordial, open to learning, and enjoyable to work with — I can’t go quite so far as our corset enthusiast educator friend Lucy does, and conclude that the “20/20” program was overall not helpful to our cause. Our cause stands by itself, and should be promoted only to those who want to know the truth. Folks who take their time to be thoughtful about the limitations and primary purpose of entertainment vs. educational media, who seek to do a wee bit of homework and take personal responsibility to know the facts vs. the sterotype, who focus on improving their health first and foremost, and who truly care about quality in comportment and dressing, will seek out and find those of us who care about the same things. 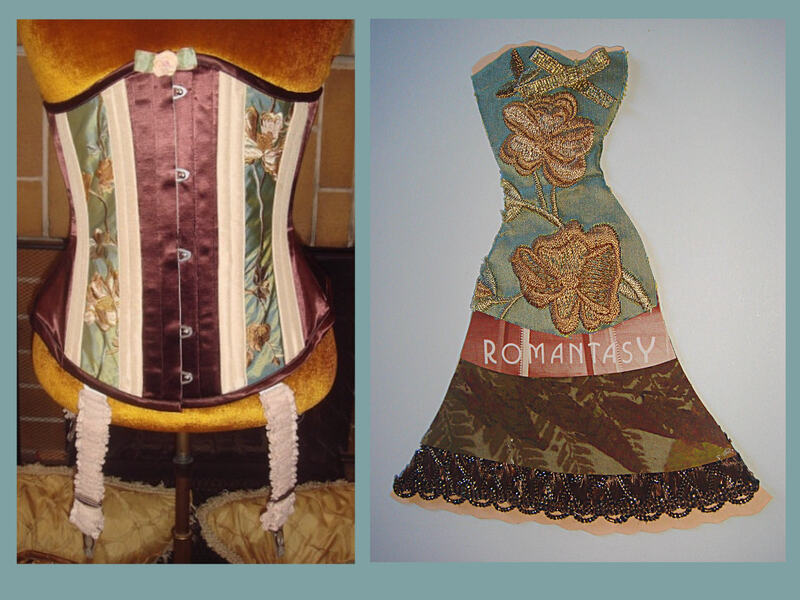 ROMANTASY was pleased recently to provide an adorable custom corset (by corsetiere Jill Hoverman) to ABC reporter Deborah Roberts (already with a svelte figure) who was game to adventure into the fun and fashionable world of corset waist training. 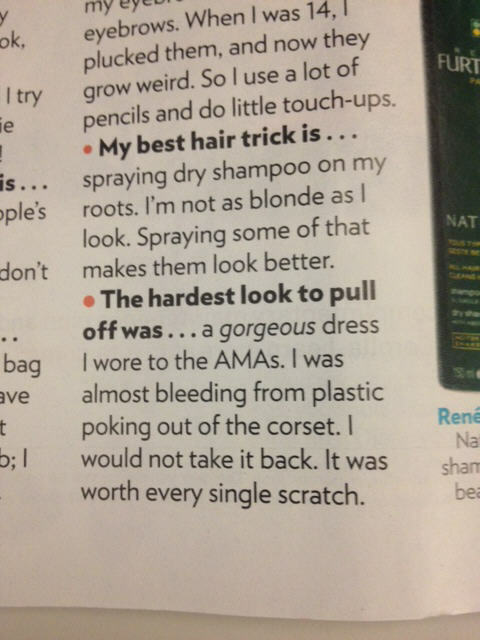 However, we must admit we’ve been holding our breath — more than any corset could hold it for us! Yet Ms. Roberts certainly hasn’t found her experience anywhere near torture! Check out her amusing and honest blog after one week of training. While the first few days were easy as she went about her business in New York City, longer hours of training brought out some crankiness and longing for the end of the prescribed period of wear. Ms. Roberts learned an early lesson to adjust her program and rest her body after she developed some skin tingling in her hip area. We advised her to take the corset off for two days, but she only had to rest for one, and was right back at it. An unyielding structured garment is certainly a far cry from Lycra-laced loose fashions to which we’ve become accustomed, and the body needs a bit of time to adjust to new sensations. Gone about it sensibly as Ms. Roberts is doing, corsets readily bestow constant gentle “hugs” that are appreciated by many. We admire her commitment to give the program her best possible effort. As we like to say, “the program works — if you work it! (and assuming common sense and respect for your body’s messages). Read more about waist training. ABC-TV’s Program “20/20” – tentatively to air Friday, Oct. 12 on corset waist training–don’t miss it! We were happy recently to be invited to participate in research and filming for a segment on the “20/20” show, possibly with a general theme of body modification. Check your local ABC-TV station schedules for time, if you are a corset enthusiast and care to see how the national media portrays this fascinating and effective process. 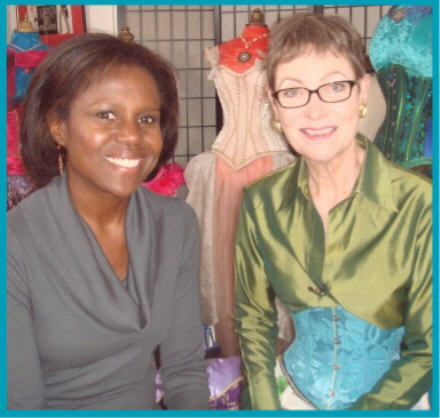 We were pleased t hat reporter Deborah Roberts who interviewed owner Ann, accepted a lovely training corset seen here. 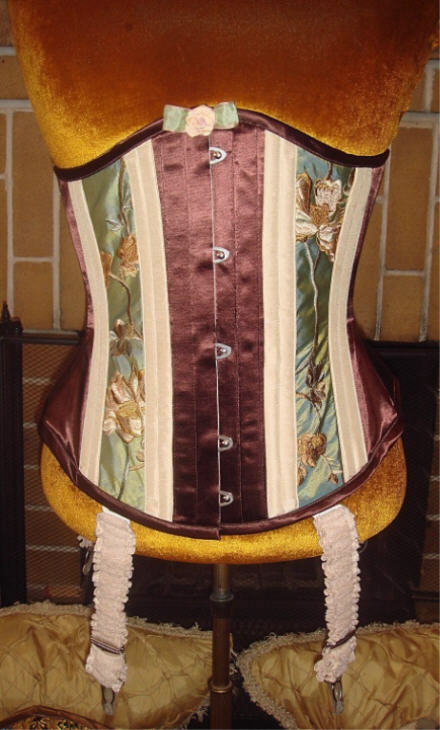 The corset was made for her by team member Jill Hoverman. Roberts is now testing the waist-training process personally as she goes about her active professional life style in New York City, and is making a video diary of her observations and reactions. As we said to her, this reaction is or may be a natural consequence for some folks when they first change from stretchy modern clothing to structured garments that remain basically immobile. If you sit for long periods of time when snugly laced, this allows a structured, stiff garment to press down on tender skin and even on the underlying bone structure, namely, the ribs. You are then restricting the flow of blood to the skin, and over time, usually during the initial days, some tingling and rib soreness when you take the corset off, may result. Skin itching is another common reaction, especially if you wear your corset in hot climates. Rib soreness is exactly what our present training student Heather seen to the right (also featured on the “20/20″ show), experienced when she first began training. After a day of only 4 hr.-corseting at a 2″ waist reduction, she noted some tenderness over her lower ribs in both front and back. By the fourth or fifth day, the soreness was more notable, but not painful. We suggested she take two ibuprofen no more than four times a day for a week, but persist in her program. By today the end of her second week of training, Heather reports that the soreness has substantially abated and is almost gone. For some students who report tingling or soreness, we might recommend backing off lacing by 1/2”, or even reducing the day’s wearing time by one hour. We made that recommendation to Roberts. However, we kept Heather’s original wearing program in place because– in contrast to some of our past students– she is a highly motivated student who is also pleasantly curvy. Thus, she is a bid “padded” over the bony ribs, suggesting that the issue would soon disappear. What reporter Robert’s and Heather’s reactions confirm is the wisdom of both Victorian and knowledgeable modern-day corseters who know that corset waist training does not take five minutes! It takes a wee bit of patience, willingness to listen to your body’s reactions and respect them, and adjust your program downward, yet persist in building up to long hours of wear before lacing tighter by a small amount, and then dropping back the hours of wear. We call that the ‘roller coaster’ method of training.